AP PGECET GATE/GPAT Notification 2018, Online Registration Procedure, important dates, Eligibility, registration fee details are available at sche.ap.gov.in. 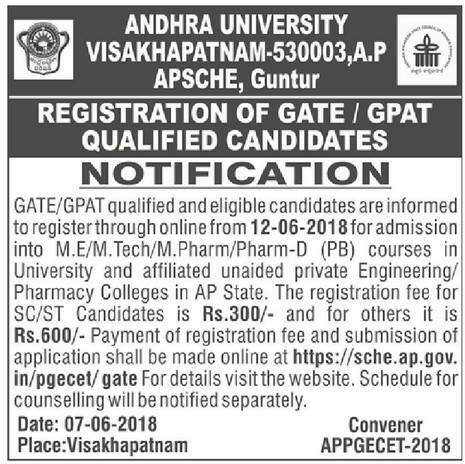 GATE/GPAT qualified and eligible candidates are informed to register through online from 12-06-2018 for admission into M.E/M.Tech/M.Pharmacy/Pharm-D (PB) courses in University and affiliated unaided private Engineering/Pharmacy Colleges in AP State. The registration fee for SC/ST Candidates is Rs.300/- and for others it is Rs.600/- Payment of registration fee and submission of application shall be made online at www.sche.ap.gov.in/pgecet/gate. Schedule for counselling will be notified separately. Post Graduate Engineering Common Admission in a State Level Admissions into Regular PG Courses in Engineering, Technology and Pharmacy (ME / M.Tech / M. Pharmacy) Courses for the academic year 2017- 2018 conducted by Andhra University on behalf of A.P. State Council of Higher Education (APSCHE), a statutory body of the Government of Andhra Pradesh State, Hyderabad. Both GATE / GPAT qualified candidates are considered for admission into ME / M.Tech / M. Pharmacy. A separate notification with details of admission schedule, certificates / documents to be produced etc. will be issued in the newspapers as well as in the web site separately. Preference will be given to GATE / GPAT Candidates in admissions to various PG Professional Programmes, and only after exhausting GATE /GPAT qualified candidates, the remaining vacant seats will be filled with APPGECET-2017 qualified candidates as per the merit order. All PG programs of part-time / sponsored shall not come under the purview of Convener APPGECET and admission to such courses are done by the respective Universities. GATE / GPAT candidates who wish to seek admissions are required to apply / register through online only (Printed hard copy of the applications will not be accepted). It is not necessary to apply / register separately for multiple courses. One application/ registration is sufficient for all eligible courses. The registration fee is Rs.600/- for OC/BC and Rs.300/- for SC/ST candidates. The detail of the courses offered by the Universities along with specified eligibility (GATE paper) for each course is given under “courses & eligibility”.Candidates are advised to check eligible GATE paper and courses before applying. Candidates should satisfy local / non local status requirements as per GO MS no.153 dated: 22-08- 2007. The existing policy on reservation shall be followed in PG admissions for the Convener seats. a) The Candidates should be of Indian Nationality. c) As per the AICTE, the eligibility for admissions into M.E / M.Tech at least 50% marks for OC and BC (45% in case of SC/ ST) in qualify degree examination. d) As per the Pharmacy council of India, the eligibility criterion for admission into M. Pharmacy Courses is 55% for OC & BC and 50% for SC & ST.
e) Candidates should qualify either in GATE/GPAT as the case may be. How to pay processing fee for PGECET candidates? There is no option for pay processing fee in appgecet.nic.in. Is it necessary to get registered for the m tech councilling (through PGCET) or we can pay the fee at the time of councilling. Manner in any private college or we should regular?? When pgecet counselling is started???? Sir, my friend get pgcet rank below thousand! And he is a SC, but he had a 3 backlogs in B.Tech. But he’s percentage is above 60. That person is eligible for to do mtech or not? Sir my friend applied ap pgecet through gate score she made payment and also status says success but the application form is not opening.. Page says last date for application is completed.. Pay late fee for submitting application..??? Sir pls help? Wt to do?